I was just thinking about doing that myself soon. I think I have a general idea where the River Des Peres pops up north of Forest Park. I didn’t realize it was above ground again in the park. I’m fairly certain that the channel reopens near the intersection of Kingsland and Vernon in University City (behind the Delmar Loop Laundry), although it remains channelized. If that’s not it, then I’m not sure. Also — the river doesn’t actually pop up in the park above ground. That’s a freshwater engineering project to simulate the river (otherwise it might smell of sewage). 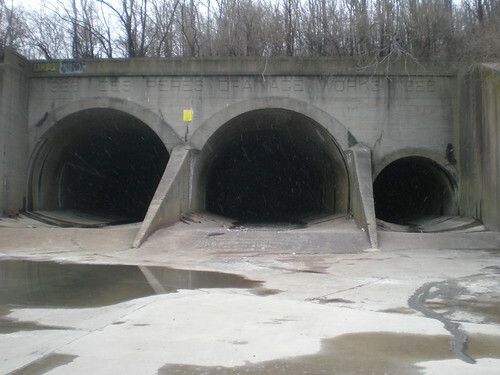 The river still runs under the park in 32-foot concrete pipes. This is a map of the MSD sewer overflows in the area, which might help you in your quest. 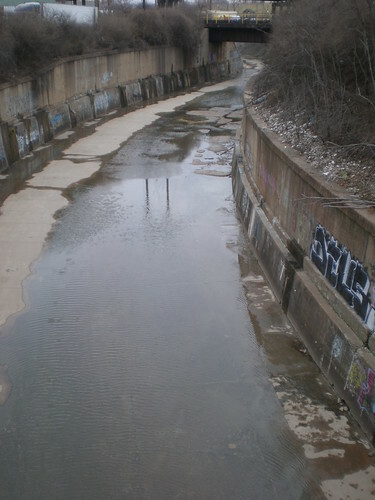 The overflows stop at the south tunnel entrance, and only begin again where the tunnel ends north of the park in University City. Wow thanks a lot. The map really makes sense because I’ve explored tunnels that lead into the approximate intersection of Kingsland and Vernon/Olive from the north, but never the channels that run into this from the West. Thanks again for the tip, I’ll be checking it out soon. I don’t know if this is helpful but I grew up in Unversity City near the RDP. At that time (50s & early 60s) it was an open creek just North of Olive St. Rd. Kingsland, in those days was divided with the open creek in the middle until it reached Etzel and bore northwest on through Pagedale, crossing Page near Pennsylvania Ave (near the old Chuck-a-Burger) continuing North towards St. Charles Rock Road. Just North of Olive it dropped into a large culvert whereupon it disappeared underground until resurfacing again somewhere south of Forest Park. Before it was completely enclosed the University City fire Department saved one or more kids who were swept underground during a downpour. In those days it was supposed to be a storm sewer only but there was always raw sewage that was carried down from the North. During particularly heavy Spring downpours it often overflowed its banks which was part of the impetus to enclose it. Very interesting, Thank you for the comment. I actually have been looking for more information about this particular stream and have wondered if it is in fact another branch of the River Des Peres. On this picture I have traced the routes of the streams. I know that the lighter blue path is the River Des Peres but did not have a name for the darker blue path until you called it the River Des Peres as well. Thanks! I did a follow up to this blog post about the River North of Forest Park but have personally not ventured out to the River Des Peres in a while. Go check it out though, it’s fun.